Adjustable handle, focusing, retractable hang hook. Rubberized non slip base and handle. Sliding, variable-focus on/off switch adjusts light from a spot beam to broad area illumination. Carrying handle folds down into a convenient table-top stand. 40 lumens, 220 hours run time, 26 feet beam distance. Uses 4 D batteries, (not included). ABS body, 5.05"W x 6.94"L, .90 lb. High capacity sealed lead acid rechargeable battery, super white halogen bulb. 28-35 minutes run time, beam distance of 164 feet. Home AC and auto DC adaptors. Locking trigger switch to prevent turning on while in storage. Rubberized comfort grip. 98 foot beam. 5 hour run time. Charge time 6 hours. Charge indicator, AC/DC charging kit included. Super bright 5MM LED bulbs never need to be replaced. 6.54" long x 4" wide, 1.16 lb. Spotlight head rotates vertically up to a 90 degree angle. Light can be adjusted from a 45 degree angle while holding the light to a 90 degree angle. The flat base allows the spotlight to stand for hands-free use. Made of rubber /plastic. 500 lumens, 587 meters. 5.5 continuous hours. 11.06" L x 6.410" W, 2 lb. with batteries. Locking trigger. Rotating bezel to change from spot to flood. Power switch has 4 settings: High, med, low and strobe. 504 high, 365 med, 202 low lumens. 4 hours 16 minutes, 6 hours 9 minutes, 13 hours 28 minutes run time. 418 meters high, 367 med and 274 meters low. Uses 4 C batteries, included. 7" L x 5.63" W x 3.44" H, 1.15lb. Pistol grip locking trigger. 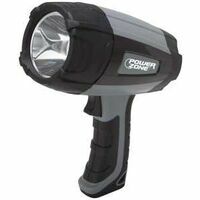 Waterproof rechargeable LED spotlight, submersible up to 10 feet. Floats for easy retrieval. Rechargeable battery, 3.7V, Lithium-ion, 2.2 Ah. 5 hours charging time. Holds charge for up to 18 months. Long-lasting super bright LED never needs replacing. 6500K bright white. 3 modes: high, low and emergency. 10W LED provides 700 lumens of light and a beam distance up to 546 yards. 1.5 hour run time at high brightness and 3 hours at low. Includes charging connector, 120V AC charger and 12V DC car charger. Net weight: 1.5 lb. Rechargeable AC/DC batteries. 750 lumen, 7 hours run time. 243 meters beam distance. 7.4" L x 4.00" W x 9" tall, 2.75lb. Features a trigger locking switch. Made of rubber / plastic. AC and DC chargers included.